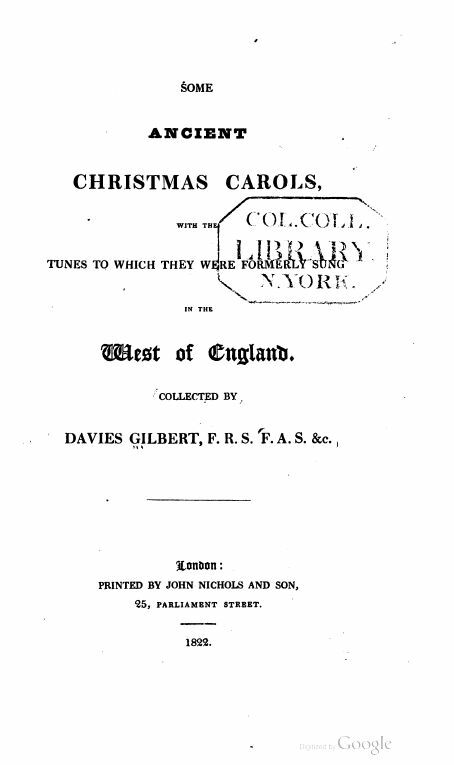 Davies Gilbert, F. R. S., F. A. S., &c.
Some Ancient Christmas Carols, 1822. The following Carols or Christmas Songs were chanted to the Tunes accompanying them, in Churches on Christmas Day, and in private houses on Christmas Eve, throughout the West of England, up to the latter part of the late century. Christmas Day, like every other great festival, has prefixed to it in the calendar a Vigil or Fast; and in Catholic countries Mass is still celebrated at midnight after Christmas Eve, when austerities cease, and rejoicings of all kinds succeed. Shadows of these customs were, till very lately, preserved in the Protestant West of England. The day of Christmas Eve was passed in an ordinary manner; but at seven or eight o'clock in the evening, cakes were drawn hot from the oven; cyder or beer exhilarated the spirits in every house; and the singing of Carols was continued late into the night. On Christmas Day these Carols took the place of Psalms in all the Churches, especially at afternoon service, the whole congregation joining: and at the end it was usual for the Parish Clerk to declare, in a loud voice, his wishes for a merry Christmas and a happy new year to all the Parishioners. None of the sports or gambols, so frequently practised on subsequent days, ever mixed themselves with the religious observances of Christmas Eve.2 Two of the sports most used in Cornwall were, the one, a metrical play, exhibiting the successful prowess of St. George exerted against a Mahometan adversary; the other a less dignified representation of some transactions at a market or fair. I've won three crowns of gold. The King of Egypt's daughter." I soon will make it cold." And I will be thy slave." To cure a deep and deadly wound?" The Fair or Market usually followed, as a Farce. Several persons arranged on benches were sometimes supposed to sell corn; and one applying to each seller in his turn inquired the price, using a set form of words, to be answered in a corresponding manner. If any error were committed, a grave personage was introduced with much ceremony, grotesquely attired, and provided with a large stick; who, after stipulating for some ludicrous reward, such as a gallon of moon-light, proceeded to shoe the untamed colt, by striking the person in error on the sole of the foot. For an ample account of various customs and ceremonies practised at Christmas in former periods, the Reader is referred to Brand's "Observations on Popular Antiquities," edited by Henry Ellis, F.R.S. and Secretary of the Society of Antiquaries, two vols. 4to.4; and to "The Clavis Calendaria, by John Brady," two vols. 8vo. In each of these works will be found a very curious dissertation on the word yule; the name of a Pagan festival, which has passed into most European languages, to denominate Christmas. The French noel is obviously derived from this word, and appears corrupted into " Now Well," when it forms a part of the Chorus in the fourth Carol; and perhaps indicates the whole to be a translation. Since the preceding page was printed, a Friend has pointed out to me what is said under the word Nouel or Noel, in "Dictionnaire Etymologique de la Langue Francoise, par M. Menage." "Le Mot de Nouel étoit autrefois un mot de rejouissance; on le crioit dans toutes les fêtes et solennités publiques. 1. Prior to Christmas Eve, the religious season is Advent, which begins on the fourth Sunday before Christmas Day; this is a time of prayer and penitence in preparation of the celebration of the birth of the Messiah, Jesus Christ. The Christmas season extends from Dec. 25 through Jan. 5. From Jan. 6 (also known as 12th Day) through Feb. 2 (the Presentation of Jesus in the Temple), the religious season is Epiphany. These forty days were celebrated as the Christmas-tide until the Industrial Revolution. The effects of the English Civil Wars highly diminished the celebration of Christmas in urban England, which was, for a time, banned (but less so in the rural areas). A re-awakening began in the early years of the reign of Victoria. Return. 3. We have several examples of these plays. See this example from William Sandys (1833): Christmas Play of Saint George. Return. 4. Compare: Brand's Popular Antiquities Of Great Britain (the Hazlitt Edition, 1905). Return. 5. I regret that my high school and college French, never strong, has not survived sufficiently to provide a translation of this note from Mr. Gilbert. Return. Note: Brady's "The Clavis Calendaria" (1815) can be found both at Google Books and the Internet Archive (both links open in a new page at an exterior location). 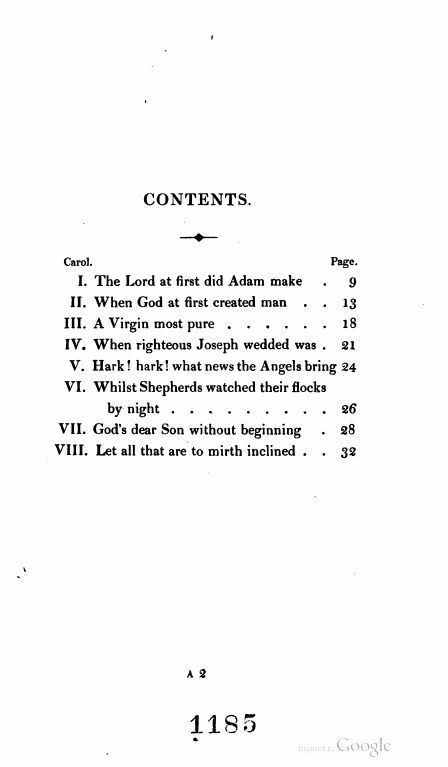 Ellis's 1813 edition of the Popular Antiquities can be found at the Internet Archive: Volume One and Volume Two, and at Google Books: Volume One and Volume Two.